This is the first of my 'Midnight Blue' X ('Orangeade' X R. fedtschenkoana) hybrids to flower. The pollen parent is a Kim Rupert hybrid given to me for study and breeding. The seedlings in the 54-08 group will be assessed for fertility, remontancy and disease resistance in the next few years. This first seedling has inherited the unusual Linseed Oil/herbal fragrance of its species grandparent, which I find intriguing. It has also inherited some degree of striping on the petals, which is curious, since there are no striped roses in its pedigree that I am aware of. Hybrids like this may provide a completely new way of looking at the early development of the Damask class and new opportunities might be found when combining these species hybrids with more modern and more diverse parents. There are shockingly few species used in the development of modern garden roses (some estimate as few as seven or eight species are largely responsible for the creation of most of the roses we now grow!) and I feel that if anything truly new is to be created, integrating other species is essential now. 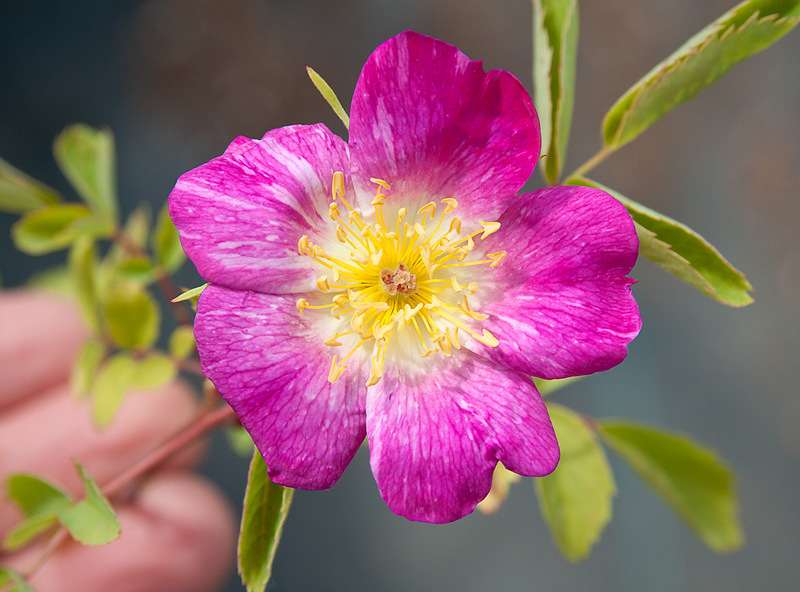 I am particularly interested in the native North American roses like R. foliolosa and R. arkansana, to name but two. Read more about some of Kim Rupert's other R. fedtschenkoana hybrids here. Looks a little like Fa's marbling instead of real striping doesn't it??? You know something else I've been thinking about? As you say there are shockingly few species involved in developing modern rose hybrids but even those original ones seem under represented and could probably produce something valuable if we went back to these as well and tried something different with new species and new modern hybrids... I only started thinking about this when looking at a 'Baby Faraux' x R. multiflora hybrid I have. It hasn't flowered for me yet but in its first year it has made a lovely shaped bush over 1m tall and wide with deep rich green foliage similar to multiflora that laughs at the heat down here and most disease. If it continues to build up as it is and it has a nice flower with that fruity multiflora fragrance its pollen parent has it could prove useful (via a selfing to bring remontancy back out) to develop good landscape roses. It's almost like these founder species were used on only a few hybrids and then from there they moved on without going back or exploring all the other crosses more deeply, getting further and further away from where they started muddying the gene pool as they went... I don't know enough about roses yet to know how extensively these founder species were used except from what I've seen on HMF. If you enter the species into the search function there is a surprisingly small number of F1 hybrids after which the number of hybrids increases exponentially from an increasingly smaller base (if that makes sense). For instance when you look at R. multiflora, HMF lists 65 F1 descendants. This list is reduced drastically if you take out the synonyms. Of the remaining hybrids only 12 have descendants themselves and a good percentage of these only have one or no descendants. So by F3 the list has been whittled down drastically but there are over 10 thousand descendants listed for R. multiflora! Then there are all these interesting multiflora x species roses listed and none of them have any descendants listed. It's almost like they didn't produce showy double or exhibition flowers in the first cross so they weren't taken any further. I guess we are always smarter in hindsight and if the early hybridisers could have foreseen the state of modern roses maybe they too would have tried to utilise these species crosses more. So... whilst I agree that we should be using as many of the under utilised rose species as we can, maybe we should also be going back to some of these founder species too and taking a longer term view of them to see what they can produce past F1. It's all very interesting!!! "It's almost like these founder species were used on only a few hybrids and then from there they moved on without going back or exploring all the other crosses more deeply, getting further and further away from where they started muddying the gene pool as they went..."
I think that if you stuck with a group of F1 species crosses and recrossed selections and did selfings to select for specific traits, you would be regarded as a "dawdler", when in fact we know that some of the best disease resistant strains have come from precisely that approach. There are R. multiflora derived breeding lines developed by research groups that have superior disease resistance (David Zlesak posted a link to an article about these sometime in the past two years) and the L83 line from AgCan/Svejda has similar qualities. Robert Basye accomplished some of the same things with plants like Commander Gillette and others. It takes perseverance and dedication to concentrating SINGLE traits before moving on, and most breeders aren't willing to do that, unfortunately. This is especially true where commercial ventures are concerned. So, it is up to you and me, Simon, to build up strains of hardy, disease-FREE roses for future generations. We might easily spend twenty years isolating ideal qualities in a couple of breeding lines, but if it resolved some of the problems completely, isn't that worth it? I say yes. Absolutely... the species I am most excited about at the moment is Rosa longicuspis var. sinowilsonii (or whatever its official taxonomic epithet is now???). It seems to love it here more than any other species I've got and it also seems open to the idea of being a good Mum (I think mine is 'Wedding Day' but it's near enough). I must also buy R. glauca... that's another one that fascinates me. How are your clinophylla hyrbids coming along? I have tried to work with my R. glauca for several years but the seeds refuse to germinate. Perhaps I have a particularly stubborn specimen, I dont know. Maybe I'm not stratifying the seeds hard enough. Some folks have generated some lovely hybrids from it. I hope I might have some success one of these days. PS: the first generation R. clinophylla hybrids set seed fairly easily, with a wide range of pollens, but only very few of the seeds germinates, indicating the typical first generation infertility problem. I have, however, got a handful of seedlings from each of three selections of (0-47-19 X self) X R. clinophylla and I hope some of these will show improved fertility. Time will tell. Right now, I will be happy if they just survive to maturity! 72-08: mossy Spinosissima cross updated.